Night at the Zoo - A 21+ Party at Lincoln Park Zoo, Chicago! You are here: Home / Night at the Zoo - A 21+ Party at Lincoln Park Zoo, Chicago! More About Night at the Zoo - A 21+ Party at Lincoln Park Zoo, Chicago! Discounted tickets on sale NOW, click for details! 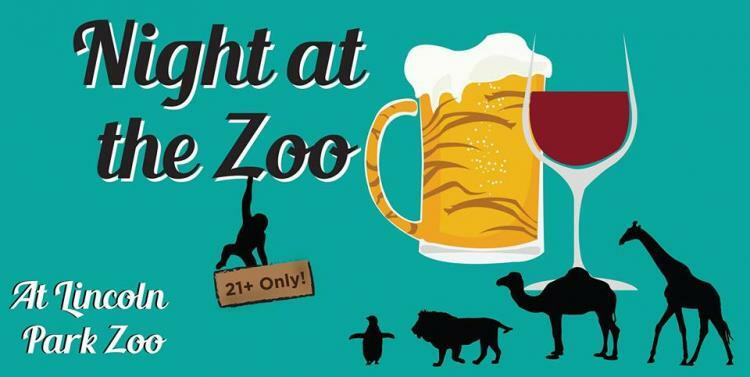 Join thousands of fun-loving people for “A Night At The Zoo!” This adults only event will give guests the opportunity to enjoy beer & wine while taking in views of the zoo’s amazing animals & gardens. There will be food, beer and wine for purchase, DJ entertainment, games, giveaways & more! Take a break from the bars and do something different; spend a Night At The Zoo with your friends! FRIDAY NIGHT PRE-PARTY: Join us at Public House on Friday, July 20th. Mention that you are there for "Night at the Zoo" at the host stand between 9pm and 1am to receive a drink on us! AFTER-PARTY: Join us at Moe's Cantina River North on Saturday, July 21st. Mention that you are there for "Night at the Zoo" at the host stand before midnight for one free gift card! All attendees will also receive the following Freebies*: Use code 'CTS2' for 2 FREE rides from Lyft (up to $5 off each of your first two rides) – 2 FREE rides in an affordable ride share with Via using promo code 'CTS2' – Up to $10 towards a FREE taxi ride from Curb with promo code 'CTS10'– $25 in on-demand laundry service from Tide Spin with promo code 'CHI25' – $10 in FREE food at your favorite restaurants like Freshii, Protein Bar, Rockit & more from Ritual! *All offers valid for first time users only and subject to change without notice. PHOTO CONTEST: Enter to win our PHOTO CONTEST by posting pictures to Facebook or Instagram using "#NightatTheZoo" Our panel of judges will go through the pictures and winners will be contacted after the crawl! All guests must be 21+ with a valid government issued ID that will be checked by security prior to entrance. A valid ticket with scannable QR code is required by all guests to enter event. It is recommended to print a paper ticket to prevent any technology complications which would prevent your ticket from displaying on your phone. There is no guest list. Each ticket must be scanned. Security reserves the right to inspect all bags and persons. Absolutely no outside food or beverage may be brought into the event. Guests who are deemed intoxicated (or otherwise unfit), will be denied entry and no refunds will be given. We want all guests to enjoy themselves, but our number one priority is the safety of all guests. Any ticketing/technical issues will be handled by Eventbrite. To contact them directly, click for details Sorry – no refunds or price adjustments. The Eventbrite system does not allow us to restrict people who are underage from buying tickets. If you are not 21 and purchase a ticket, you will not be allowed into the event.